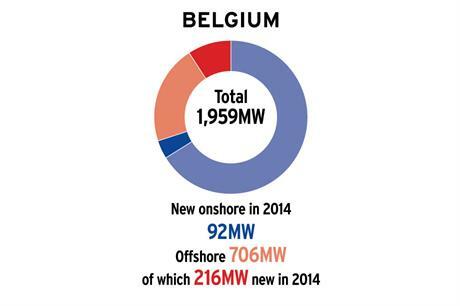 Belgium added a healthy 308MW in 2014, including 216MW offshore, bringing total installed capacity to 1.96GW, of which 712MW is offshore. While onshore capacity should grow by at least 200MW this year, in line with 2014, no new turbines will be installed at sea. Beyond 2014, concerns over regulatory issues make the long-term outlook for onshore wind uncertain. Most of the new onshore capacity was in Flanders, mainly due to legal wranglings and a sharp increase in the number of appeals in Wallonia. Developers have concerns over new noise legislation, local taxes and a revised spatial plan, while the Flemish government is again talking about reviewing the support mechanism. New nationwide renewables targets are expected by the end of the year. As for offshore, the 216MW Northwind project came online last year, and Alstom's prototype Haliade 6MW turbine, installed in 2013, was connected to the grid. Looking further ahead, five projects totalling 1,374MW have been revived thanks to grid operator Elia receiving the go-ahead to upgrade the high-voltage onshore grid. The two most advanced are Rentel (288MW), owned by the Otary consortium, and Norther (350MW), jointly owned by Eneco and Elicio. Both hope to reach financial close and start construction by the end of 2016.